Until my early twenties I was a dedicated egg-phobe. Then I was suddenly converted, and though I still won’t touch an underdone egg, I love ingredient-loaded omelets. When I discovered Spanish tortilla (not to be confused with the flour and corn tortillas of Central America), I fell in love from the first bite. This is the universal crowd-pleaser and my brunch or weekend dinner staple. Thicker than the Italian frittata and usually containing my other favorites – potatoes – this Spanish omelet has as striking a flavor as its looks. It’s easier to make too, as you don’t have to fight to flip it over, but simply bake it in the oven. It can stoically take on whatever you throw at it, and no fridge push-around need be wasted again. The classic one with potatoes is great, but I’ve done it with zucchini, parsnip, feta cheese, Parmesan, bacon, various types of dried and fresh herbs, and combinations of the above. It’s a successes every time, and the only person who refuses to eat it is my daughter – the new egg-phobe in the family. I finally have a cast-iron paella pan, perfect for tortillas too, which I put to heavy use. The recipe is enough for four as a weekday supper, or for eight as part of a weekend brunch with friends. If there are leftovers, they are very good the next day and make a great lunchbox item. I often wrap them in whole-wheat tortillas with Tabasco’s Chipotle sauce and fresh cilantro (coriander). I love to answer the what’s-for-lunch question – tortilla in tortilla. For a vegetarian version skip the sausage. Preheat oven to 375°F (200°C) – with racks positioned in the middle. In a heavy-bottomed oven-proofed frying pan (cast iron is best), melt the butter and olive oil over medium high heat. Saute the potatoes until slightly brown and tender – about 10 minutes. In the meantime beat eggs in a bowl to break the egg yolks. Add the ricotta and beat well – though some cheese lumps are OK. Season with salt and black pepper to taste, add the herbs and green onions and mix. 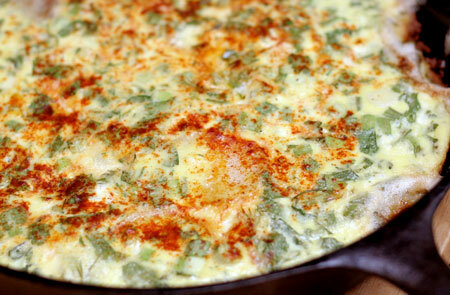 When the potatoes are ready, take them out of the pan with slotted spoon and stir into the egg-cheese mixture. Add sausage to the pan and fry for 5 minutes, until sightly brown. Add onion and garlic and cook for 2-3 more minutes. Pour over the egg-cheese-and-potatoes mixture, stir well, and let cook on medium low for 10 minutes. Sprinkle with smoked paprika and transfer the pan to the oven to bake for 10-15 minutes or until the top of the tortilla is set and slightly brown. Serve warm with the pan (makes a great impression) with rustic bread and simple green salad. My son loves it with a few drops of Tabasco Chipotle sauce. I have it with extra Bulgarian cheese, feta style. Goes great with a light, bubbly Portuguese Vinho Verde or Italian Prosseco for a more elegant experience.